Sinopec TULUX T700 Synthetic CK-4 15W-40 Diesel Engine Oil is formulated using Synthetic Technology with hydro-cracked high viscosity index synthtetic base oils and Superior low SAPS additive packages. It is the new generation of DEO to meet strict new emission, long life protection performance and fuel economy and environmental standards. Suitable for use in high speed, four-stroke heavy duty low-emission diesel engines fitted with exhaust after-treatment systems designed to meet Euro V and Euro VI exhaust emissions standards. Heavy duty diesel engines (HDDE) fitted with exhaust after-treatment systems, e.g. exhaust gas recirculation (EGR), diesel particulate filters (DPF) or selective catalytic reduction (SCR), which require a low-ash lubricant to meet Euro V & Euro VI or Australian ADR 80/02 and 80/03 emissions requirement. Heavy duty diesel engines operating continuously under very high speed, high temp or heavy load conditions, including on and off highway, trucking, bus, mining, construction, agriculture and marine applications in the world’s harshest environment. Fully backwards compatible to those older HDDE using conventional designs without exhaust after-treatment systems. 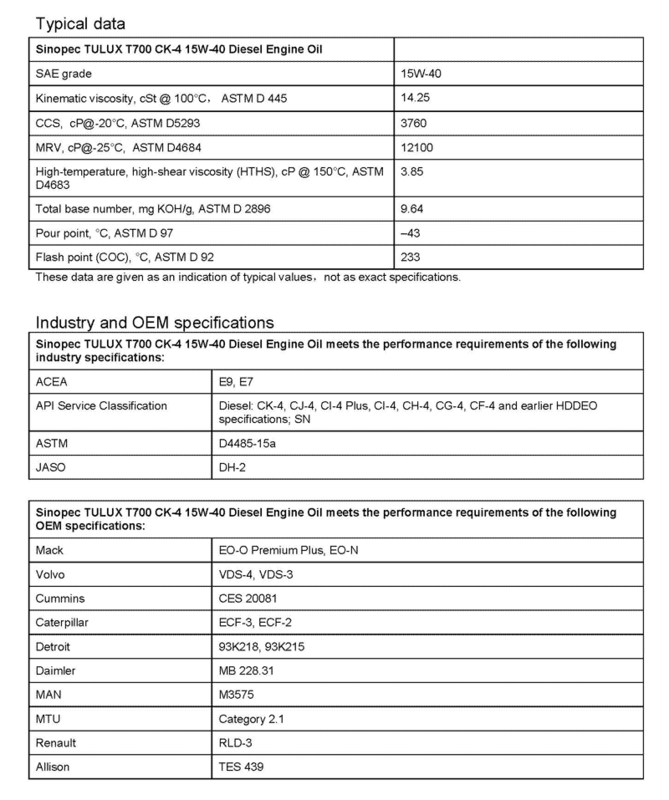 Heavy duty diesel engines requiring API CK-4, CJ-4 and earlier categories or ACEA E7/9 from America, Europe and Japan. Provides extended long term protection all engine parts including DPF and SCR device, and proven longevity of aftertreatment devices designed to meet the stringent Euro V or Euro VI emissions standards. Super anti-wear properties reduce engine component wear effectively extending engine life. Excellent oil oxidation resistance and improved control of the piston deposits along with enhanced dispersant/detergent properties prevent the formation of sludge and piston deposits, keeping the engine clean and reducing energy loss due to frictional wear. The highly refined base oil and premium viscosity modifier offer outstanding shear stability and prevent viscosity loss caused by the molecular shearing common in high speed diesel engines, extending oil life and ensuring optimum oil film thickness to provide protection on all moving engine parts. Providing high performance in both on and off- highway heavy-duty applications. Extending drain intervals while providing increased protection can lead to reduced downtime and increased profitability.